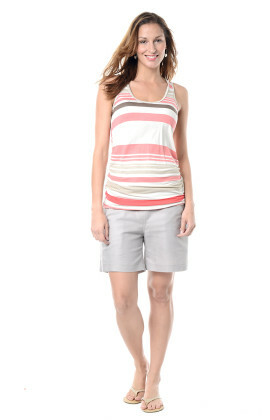 The soft, relaxed fit makes this top a great way to stay cool and comfortable in the heat of summer. The gorgeous print in hues of blue with black and stone makes it easy to match with many other items. Pair it with jeans, legging and pumps or shorts and sandals. If you need a little extra coverage, it will look just as good layered under a cardi or denim jacket. We recommend a delicate machine wash taking care not to add other items that might snag the fabric. There is no need to iron this item as this may alter the crushed effect. Bleaching, tumble drying or dry cleaning are not suitable.